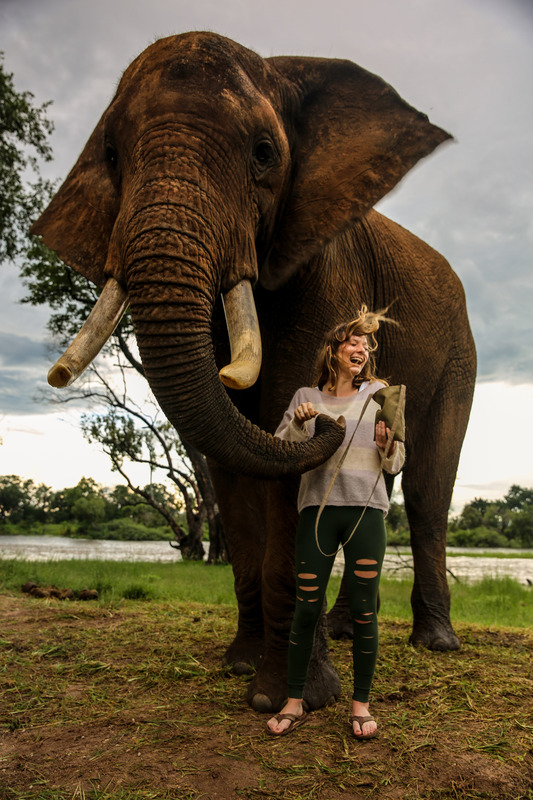 Supporting a herd of ten rescued elephants and located on the banks of the Zambezi River, is Zambia’s top gourmet wildlife experience “The Elephant Cafe”. A stunning combination of three exclusive experiences. 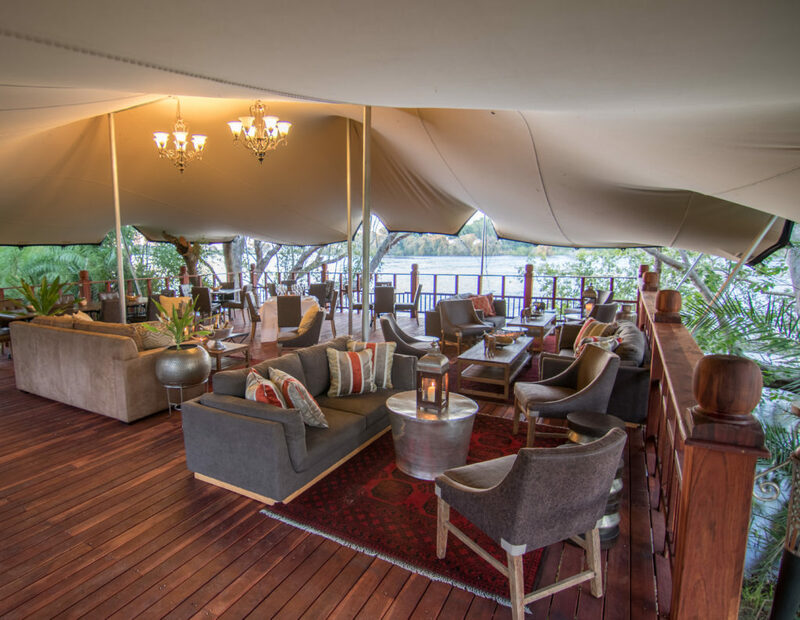 An epic boat trip up the Zambezi River, an encounter with a rescue elephant herd and a gourmet meal in a salubrious setting. 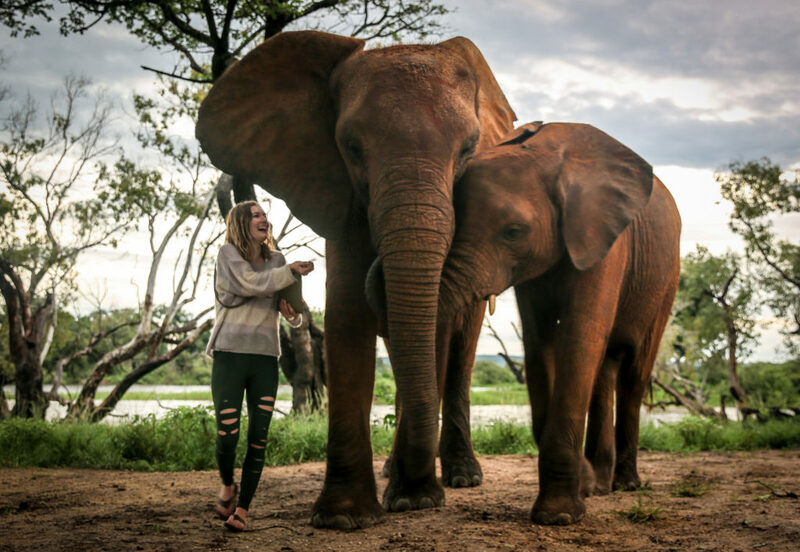 The Elephant Cafe’ is a heartwarming bucket list activity, taking the region by storm. 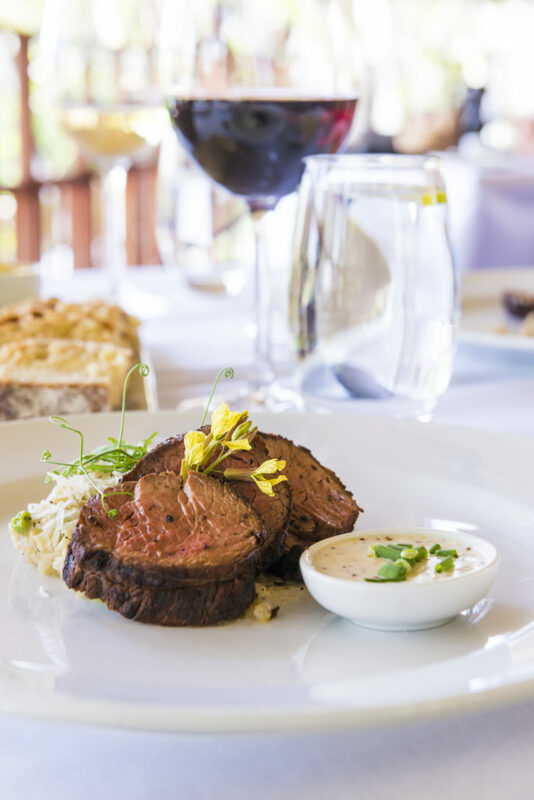 Right on the banks of the Zambezi River, The Elephant Cafe’ has the perfect setting for an awe-inspiring meal. Getting to The Elephant Cafe’. While you can choose to use a road transfer to access The Elephant Cafe’. By far the more preferred method is by boat. 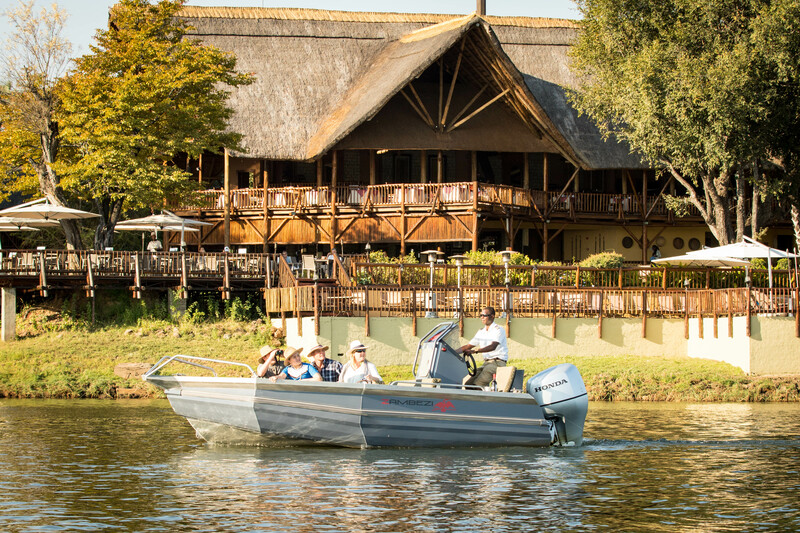 Trips depart the David Livingstone Safari Lodge and Spa Jetty. Departure is from the David Livingstone Safari Lodge and Spa Jetty. The Elephant Cafe’s guests are treated to a thirty to forty-five-minute journey through the waterways of the “Mosi-oa-tunya” National Park. The trip up to The Elephant Cafe’ provides phenomenal bird and animal sightings. These are Egyptian Geese, uncharacteristically flying in a flock. 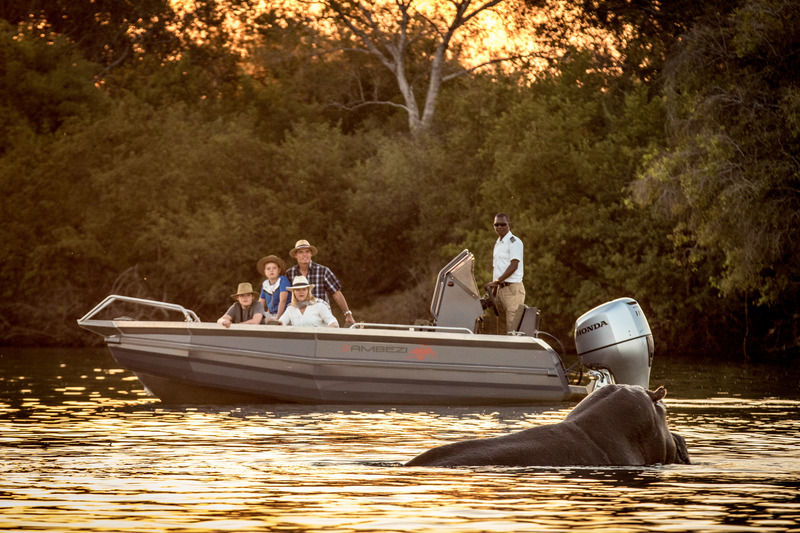 These river transfers are run by “Zambezi Expeditions”. The owner of “Zambezi Expeditions” Daniel Watson drew off experience gained in Queenstown, New Zealand, in the jet boat industry. Shallow basalt rapids characterize this section and it was always deemed to be un-runnable. 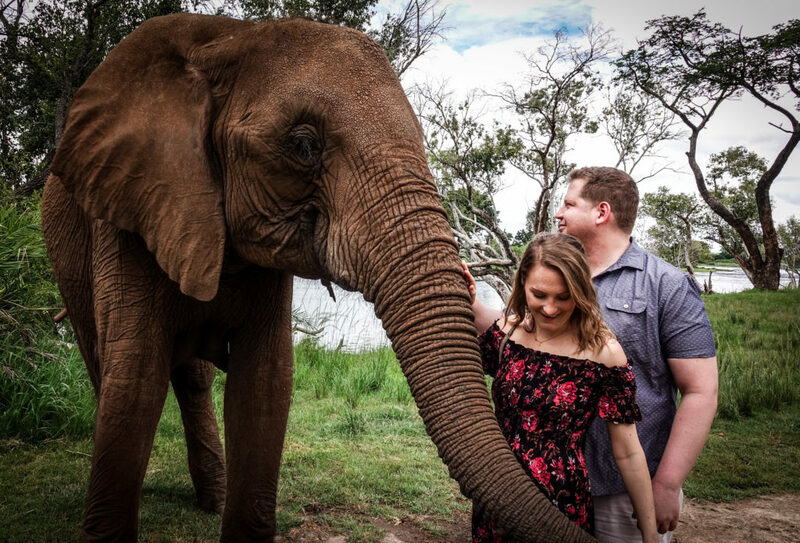 Along with his team of professional drivers, Dan has pioneered commercial routes up to The Elephant Cafe’. The transfers are the first commercial boat use, of that section of the park. Hippo’s are often seen on the trip up to The Elephant Cafe. 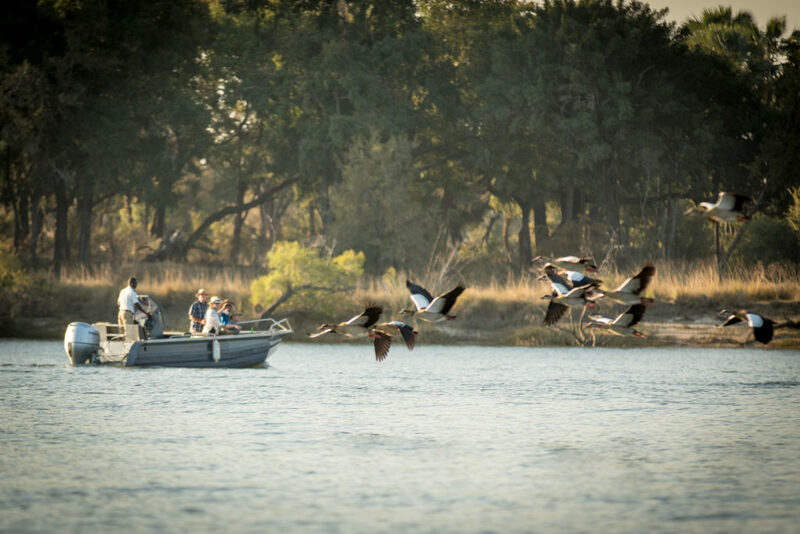 Fiercely territorial, the general rule of thumb is to give them access to the deep water should they feel the need to move away from the boat. On the boat expedition, guests can expect to see a variety of river-dwelling wildlife. 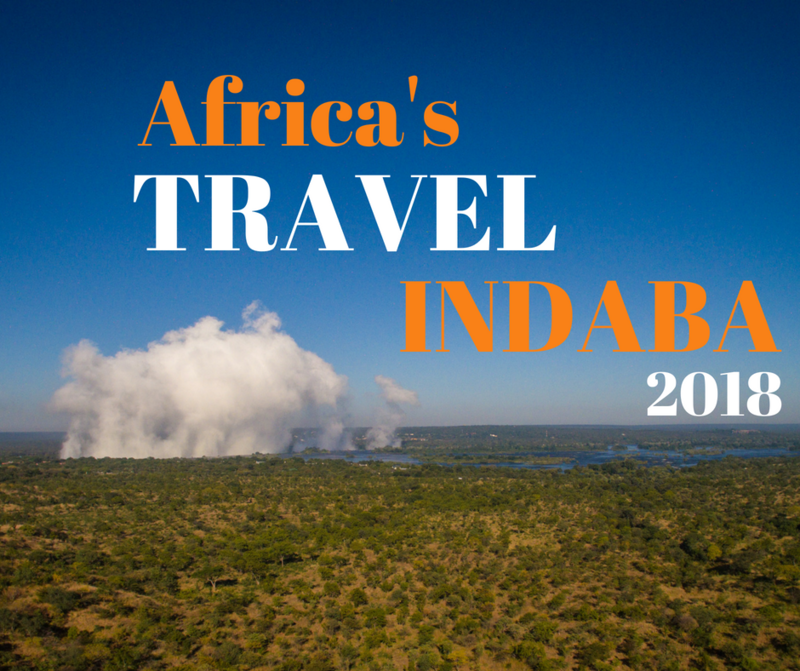 Sightings of Hippo, Nile crocodile and a huge range of birdlife are common. 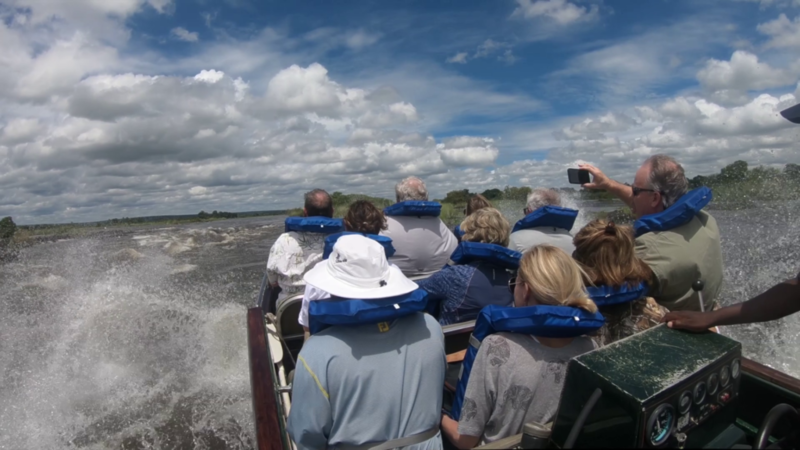 Added to this wild aspect is the excitement of being on the Zambezi River, tackling the class-2 rapids. Expect to get lightly splashed but not drenched. Guests going up one of the small rapids en-route to The Elephant Cafe. The raison d’être for the existence of the elephant cafe’. “The Elephant Cafe’s” ten rescued African Elephants. The Elephant herd is made up of an eclectic group of African Elephants. The elephants all have varied, intriguing and different backstories. Together they make a tightly knit though unusual family herd. Complete with a variety of foibles and fascinating nuances. Unusual in the sense that the herd is comprised of breeding age females, playful youngsters, mature and immature bulls. Whereas in the wild, you wouldn’t usually see this configuration of animals. In the wild old mature males tend to be solitary, while young bulls tend to gather in small bachelor herds. The females and youngsters tend to stick together in family structured breeding herds, led by a matriarch. On arrival at The Elephant Cafe’ guests are met by the herd. 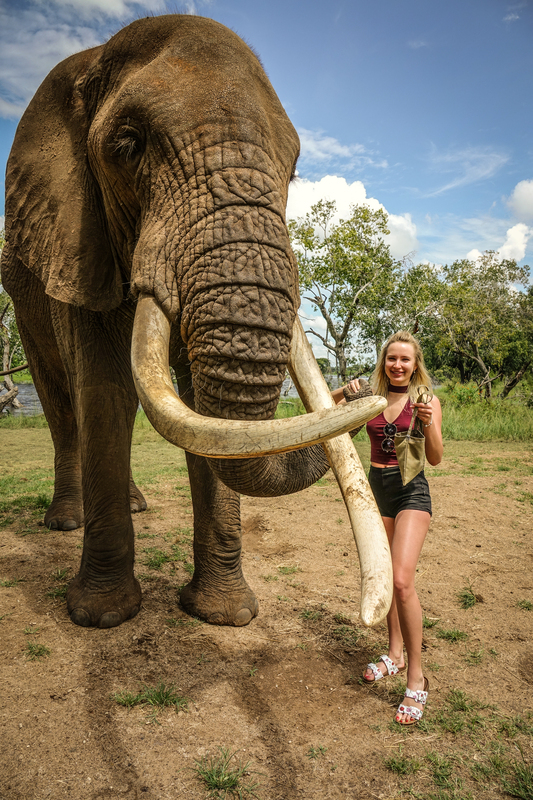 Guests then have the opportunity to interact and photograph the elephants in a reward based interaction. 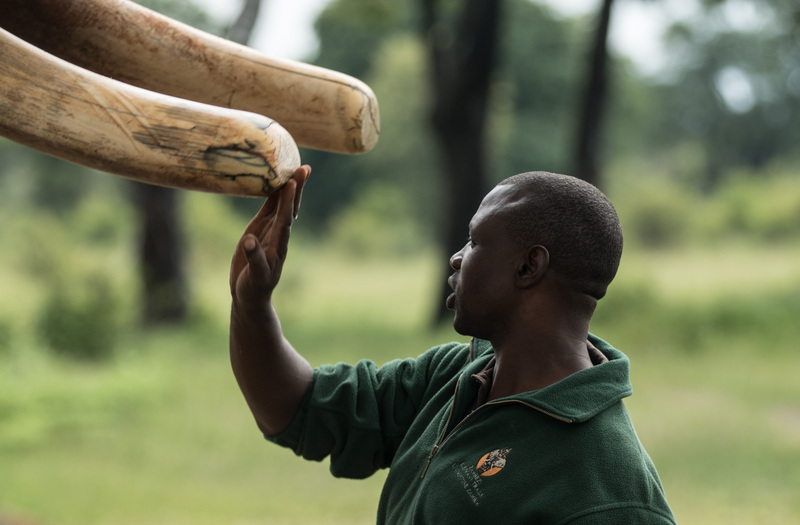 On hand are the elephant experts to dispense information, answer questions and provide insights into the herd’s behaviour. 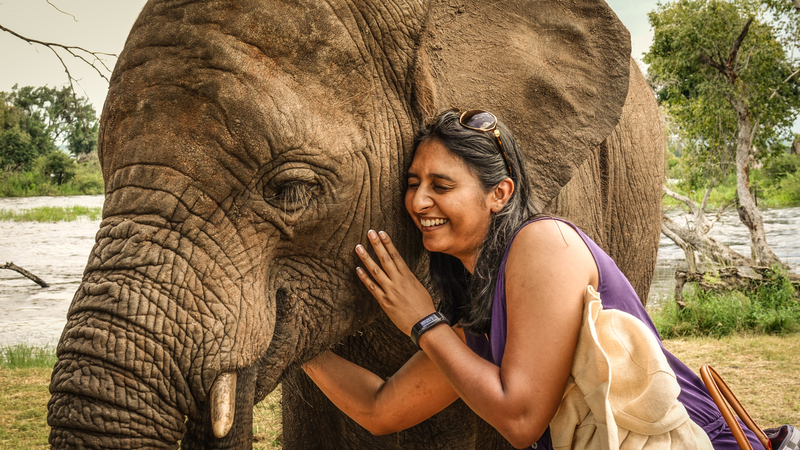 Guests are invited to interact with the elephant herd. The elephants really enjoy this, almost as much as The Elephant Cafe’s guests. The below brief descriptions of The Elephant Cafe’ herd, present merely the tip of the iceberg with these magnificent animals, with regard to their habits and stories. You will have to visit to hear more. The Elephant Cafe’s “Bop” and “Danny”. “Bop” and “Danny” are the two mature bulls in the herd. “Danny” though younger and smaller in body size than “Bop”, is the dominant male. “Bop” is a mellow old man, estimated to be about sixty-five years old. “Bop” on his way up to The Elephant Cafe’, he does interact with guests on occasion but seems to prefer being in the background. Due to a crack in his left tusk, “Bop” has had his tusks cut by the vet. If the crack had been left unattended the extremely sensitive nerve would have been exposed. An elephant root canal, though it has been done, is a risky and cumbersome procedure. In this case, prevention was definitely better than cure. Interestingly, one-third of the tusk is actually within the lip of the elephant, what we see is only two-thirds of the actual tusk. Anthony examines “Bop’s” split tusk, you can see it on the far tusk in this picture. It used to run all the way from the tip of his tusk but looks to have stopped well before the sensitive nerve. “Danny” has a very distinctive and huge set of ivory. He is thought to be about fifty-five years old. Both of the bulls were rescued from culling operations in Zimbabwe in the 1960’s. Danny has a very large and significant set of Ivory, easily identifying him from “Bop”. He is also slightly smaller in body size. “Bop” and “Danni” are perhaps the first generation of rescued African elephants. The two were raised by the late legendary conservationist Clem Coetzee. Members of the Coetzee family still come and visit these old boys from time to time today. The Elephant Cafe’s “Madinda”, “Mashumbi”, “Marula” and “Lewa”. These animals are the second generation of rescue elephants. Estimated to all be in their thirties, they were rescued as calves from the severe El Nino droughts of the late 1980’s. “Marula” is a young bull and “Lewa” is a young sexually mature female. The two were rescued together and have been lifelong companions. “Lewa” likes to rumble and talk and is often seen close to “Marula”. “Lewa” interacting with clients, she is very fond of people, probably as she was bottle fed as a calf. “Marula” is a very affectionate Elephant, in part because he and “Lewa” were bottle fed as calves. “Marula” is often seen with the calves who find him comforting, especially the orphan “Sekuti”. “Madinda” is a young bull who during the droughts was rescued from a predator attack. He has half a tail and a missing portion of his ear from that encounter. 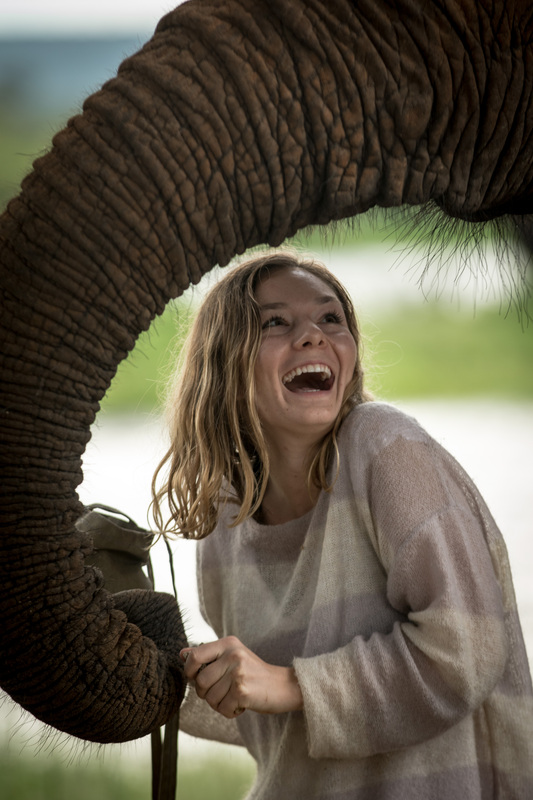 Madinda is delightfully playful and many a guest has a story of “Madinda”, the dancing Elephant. “Mashumbi” is the herd’s matriarch and leader. She is also the survivor of a predator attack and is missing the tip of her tail. One of our favorite stories is her elopement. She disappeared with a bachelor herd for 18 months. Returning to The Elephant Cafe’ pregnant…with her typical nonchalant lack of fuss. “Mashumbi” is easily recognizable from her missing tail, when she was a calf she was attacked by predators after being left by her herd. While elephants are exceptionally social and the family units are close-knit. In times of drought or danger, it is not uncommon for the herd to move rapidly and cover big distances. Reaching food and water is a priority and young calves get left behind as the herd moves rapidly for survival. The calve’s mother will usually move back and forth between the calf and the herd, urging the calf to keep up, however, this distance can become vast and the mother is forced to leave her calf behind. Mashumbi and her calf Muyuni. These four are the youngsters of the herd, sexually immature sub-adults and calves. “Nandi”,”Nyami” and “Muyuni” in order of age, are the offspring of “Mashumbi” and “Lewa” sired by “Bop”. “Muyuni”, a very affectionate young Elephant. “Nandi” at eleven is the oldest, “Nyami” and “Muyuni” are a year apart born in 2013 and 2014. Since 2014 with advancements in prophylactic safety and administration, the herd is on birth control, to avoid any more captive births. “Sekuti” arrived before “Nyami” and “Muyuni” were born, he followed the herd into the Elephant Cafe’ from one of the surrounding islands the herd likes to frequent. “Nandi” instantly became infatuated with the young bull calf. She is his protector and while at night he likes to be near “Marula”, during the day “Sekuti” and “Nandi” are nearly always together. 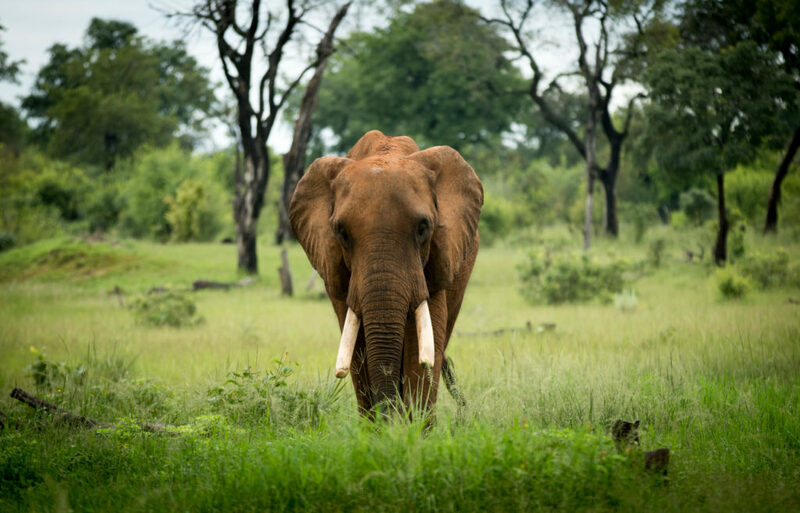 Desperate attempts to locate “Sekuti’s” herd proved futile and he has been a part of The Elephant Cafe’ crew ever since. 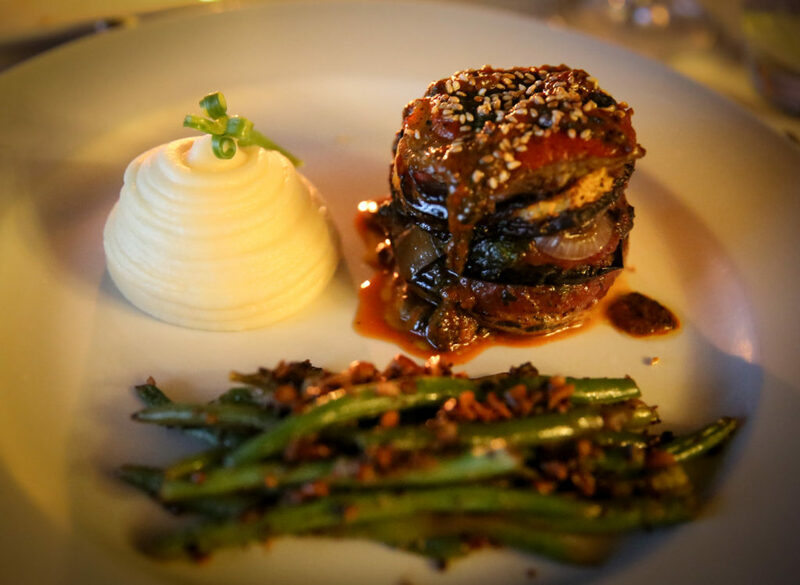 The Elephant Cafe’s food is a gourmet experience second to none. 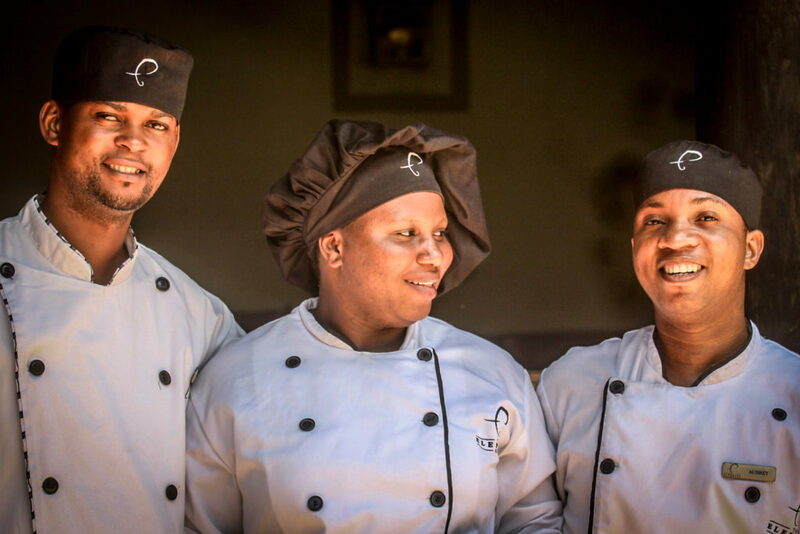 Meet Lovedale Nombwana, Adelina Banda, and Aubrey Tilimboi the team of Zambian Chefs. The trio is constantly aiming to impress. To support local businesses and farmers and ensure freshness. 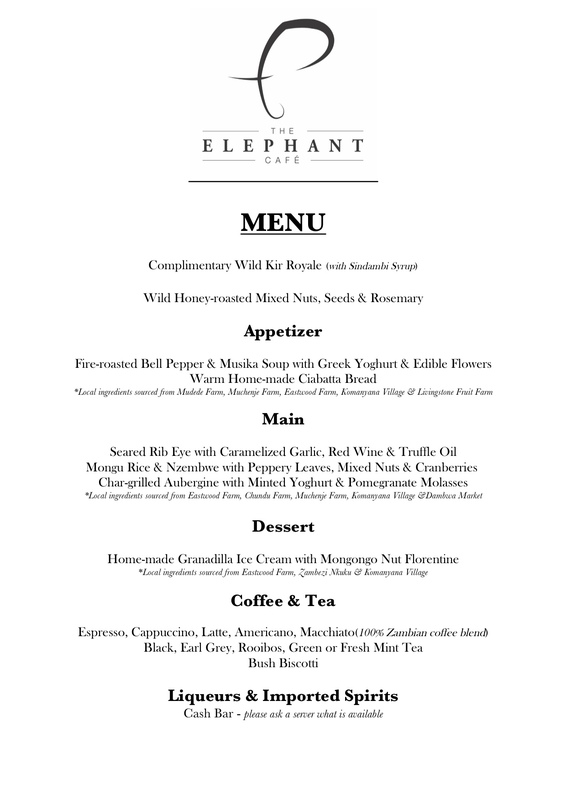 All of the ingredients used in the menus, are sourced from within twenty kilometers of The Elephant Cafe’ it’self. Vegetarian and vegan options are available. 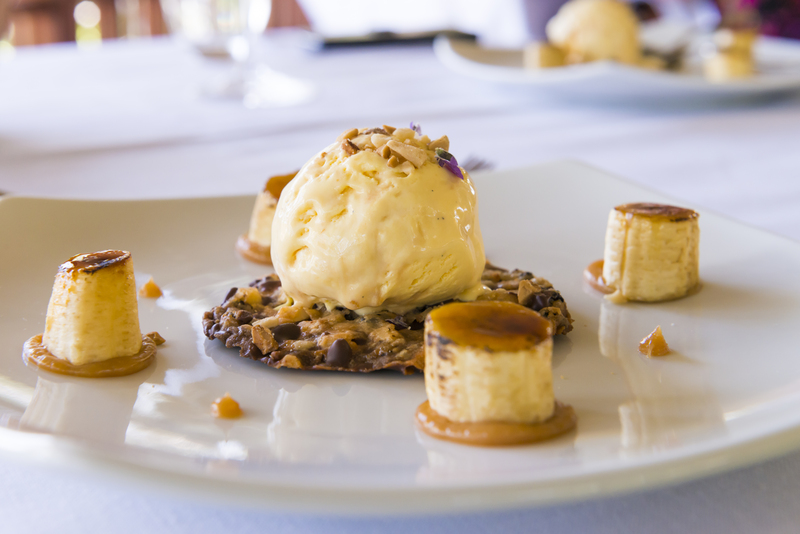 Mangongo nut ice cream, the Mongongo nut is a common elephant food, which the herd actively seeks out. Pretty good for the guests too. A sample menu, the food is continually changing according to the seasons and what is available. Min Age is 10yrs for safety reasons – we find both children and elephants to be unpredictable in nature! 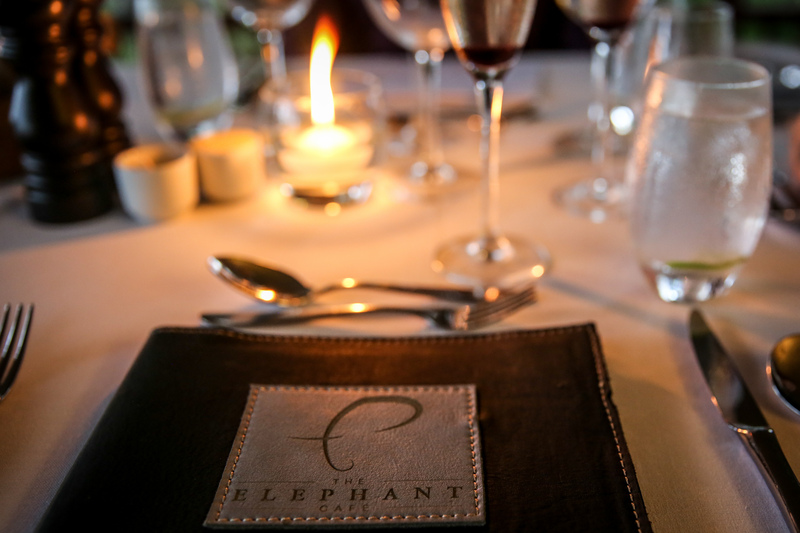 The Elephant Café is ideal for a special occasion or private booking. Exclusive-Use of The Elephant Café is permitted – contact us for more info. Picture Credits: Sean Edington, Annie Little Photography.